Volume 7 in the Polish newspaper CD series has been released. 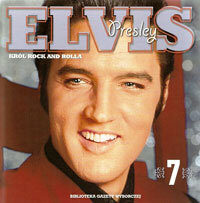 The CD/book combination entitled "Krol Rock And Rolla" contains 17 tracks. This set was released through one of the most popular daily newspapers in Poland, Gazeta Wyborcza (Election Gazette), in conjunction with Radio Zlote Przeboje (Golden Hits Radio).